I fancy I have pretty good taste. I keep my inner cheese beast in a cage inside my soul. But once a year, when the wind blows cold the leaves fall from the trees, I open the gate and let him romp over the moors, bug-eyed and howling, to terrorize the citizenry with his terrible lead guitar playing. The Halloween Special this year is a cover of "(You Got to Pray to the Lord) When You See Those Flying Saucers" by the Buchanan Brothers. The 'Brothers, despite their upbeat bluegrass melodies and elegant harmonizing, were superstitious men who lived in constant fear of the devil and atomic destruction. Listen to their 1946 hit "Atomic Power" here. 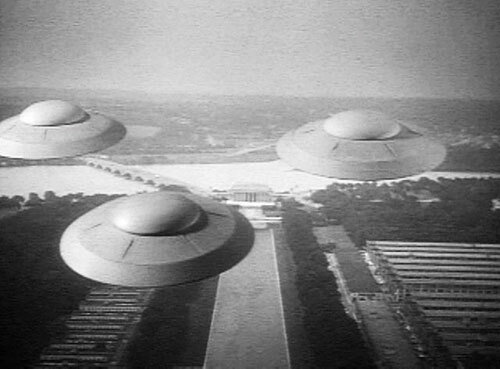 The Louvins penned "When You See Those Flying Saucers" in 1947, and I haven't changed a word. All I've done is give it the minor key it deserves, and tack on a spooky intro. If you like it, I'm available to score your horror movie, but you have to shoot it before Halloween. And if that's not enough, why not relive past glories? Check out the 2011 Bang & Jangle Radio Hour Halloween Special here. They say radio is the new tv. I doubted it too at first, but now I've got proof. I've been listening to a lot of This Is That, a sophisticated satire show that makes me laugh until I cry. I cannot recommend it enough to anyone who likes that sort of thing. Regular CBC listeners have probably heard at least a little bit of This Is That by accident, and felt confused or outraged before the penny drops. The show mimics our national broadcaster with deadpan accuracy, from the diction of the hosts to the muffled sound of an interviewee's telephone to the music cues in between. In fact, the show is so successful at mimicry it regularly receives calls from outraged, earnest listeners who haven't clued in yet (more on that here). In fairness to the show's creators Peter Oldring and Pat Kelly, those people are probably idiots. Mock stories on the show include a piece on Innovation Hour (a holiday we turn on every appliance in our home for one hour, in honour of the innovators who made that possible), an announcement by Quebec that it would lower the drinking age to fourteen, an RCMP investigation of a brutal beaver-fighting ring, a decision by the Saskatoon police force to institute Casual Fridays, the discovery of a "new wind" that blows straight down, and an interview with the inventor of the new extreme sport Para Ski Dooing. Those make reasonably funny headlines, but they are gutbustingly hilarious when Oldring and Kelly dig in. What's even more remarkable is how few actors appear on the show - the main duo handle most of the voices, male and female, and do an amazingly good job of camouflaging themselves interview after interview. Imitations of documentaries are bang-on too, right down to the sound effects.